Every week in 2013, I’m sharing a different way you can save $100 this year. If you do all of these things, you’ll be able to save over $5,000 this year alone! Many of these things will likely be things you’re already doing, but hopefully all of you will pick up at least a few new ideas or some inspiration from this series. You can save at least 20% off the price of many staple products by buying them in bulk. If you’re going to be using the bulk amount of something over the course of a year and it can be stored for a long period of time, you might as well purchase it in quantity at a discount, right? This is sort of the default, but it’s worth mentioning. I save around $27 per year by buying yeast from Sam’s Club instead of at the grocery store. However, I don’t find it is worth it to pay for the membership. Instead, I just go in on the get in free days that they have a few times per year. Be aware that not all warehouse packages are a good deal. In fact, many times, you’ll pay more per ounce for buying the large package than you’d pay if you bought multiple smaller packages when they are on a great sale at the grocery store. You can often purchase large quantities of produce seconds for great prices from local farms (check to see if there are farms near you that sell to the public). And if you like high-quality meat, you’re almost always going to save at least $1 per pound by buying it in bulk. If you don’t have freezer space for large amounts of meat or products, consider splitting a bulk order with a few friends. That way, you all get the discount, but none of you have to buy a new freezer to store it in! If you grind your own wheat or eat a lot of oats, rice, beans, or other staple ingredients, check into the prices of nearby health food co-ops or . If don’t find great sources for buying in bulk from health food co-ops and Azure Standard doesn’t deliver to your area, check and see if your health food stores or grocery stores would give you a discount for buying in bulk. It never hurts to ask! You might also just buy in bulk by practicing the Buy Ahead principle — buying multiples of items at your grocery store when they are at their rock-bottom prices! What you should buy in bulk will vary from family to family. I recommend looking at what you already purchase a lot of that has a long shelf life or would keep in the freezer for six months and see if you can find sources for purchasing it in quantities at a discount. These will usually be things like grains, beans, canned goods, and meat. But it could also include other items like toilet paper, diapers, or cleaning supplies. If you want to buy a big bulk purchase but you’re not sure you’ll use it all up, see if a friend or two will split the order with you. 2. Don’t buy things you don’t already know that you love. If you aren’t 100% sure your family loves it, don’t buy a bunch of it. Because no matter how inexpensive it was, if you’re not going to use it, it wasn’t a good deal for you. 3. Don’t store your bulk items carelessly. If you buy grains, make sure you store them properly and check them often. The last thing you want to do is find your big bag of oats is bug-infested! And do not make the $614 mistake we did and buy a bunch of grass-fed meat from a local farm, stick it in your freezer in the garage, and then leave town for two weeks. That is a lesson we hope we never have to learn again! Do you buy in bulk? If so, what do you buy and where do you but it from? One last tip I would add is don’t buy items in bulk that you might end up consuming at a faster rate. I am talking mainly about snack items, like giant bags of pretzels or crackers. I find when I buy these sorts of things in big bulk packages that unless I am very careful to just put out what we normally consume in a week (or day, or serving) the big bags go much faster than the smaller more expensive bags and therefore cost me more over the long run. I am wondering, how do others incorporate bulk purchases into budgeting? I am especially curious about how to do this for starting a budget when I already have a number of Amazon Subscribe and Save auto purchases going. This is a big stumbling block for me in trying to figure out how to budget. Thanks! 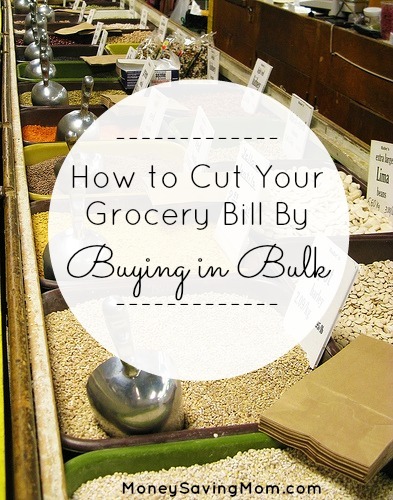 I typically set aside any extra grocery money I have each week to use toward bulk purchases. We set aside money each month for bulk items as well as case lot sales. That way we have the money available when the prices are good. There are some items I like to purchase in bulk (usually from Sam’s) for the convenience of knowing we will not run out for a while. These include: yeast, flour, brown sugar, powdered sugar, toilet paper, dog food. I have priced these items and they are a bit less at Sam’s. Because the store is 1 hr away, I do not make a special trip if we are out of 1 or 2 items, but when we are going that way I will stop by and stock up. The membership is $35/year because we own a farm ( business membership). My husband uses Sam’s for work occationally, so we do pay the fee. Also, at holiday times, we purchase gifts for employees and paper goods for parties. Amazon prime is a good bulk source for some items, and I don’t have to haul it home. I also buy in bulk from the LDS Cannery, Sam’s Club, and from Winco. 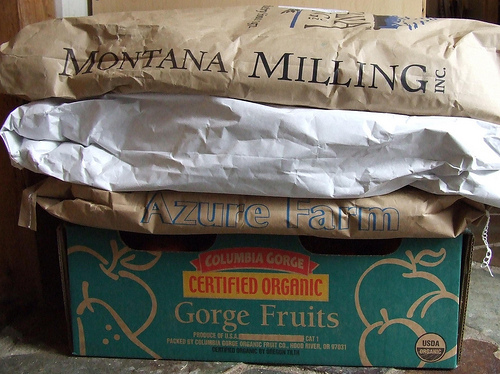 Buying in bulk saves me a LOT of time, and more than coupons on many items (such as oats and beans). I typically get a 25 pound bag of oats for $15.35, and beans are around .65 a pound in the 25 pound bags. My family eats 75 pounds of oats a year, which means breakfast (with brown sugar) for 8 people is .22 TOTAL (not per person, but for all of us) and I generally cook 4 cups of old-fashioned oats for that price. I share a warehouse club membership with a relative. You can buy other items like furniture, gift cards, eyeglasses and tires there too at a discount, and some even have lower priced gasoline for members. I buy flour, sugar, yeast, vegetable oil, cheese, meat (just got a 1/4 cow), chocolate milk mix, tp, paper towels, detergent, cat food, applesauce, honey and butter in bulk at the warehouse club. Well the 1/4 cow was from my uncle who farms and raises and butchers the cows himself. It’s grassfed and organic beef and at 2.50 per pound hanging weight, the price is right. We buy a lot of food items in bulk from Country Life Natural Foods. I like to buy in bulk and follow most of your suggestions. However, I’ve noticed one pitfall I’ve been falling into–finding a product at Costco in bulk that I really like (their frozen berry blends and their salsa) and not comparing prices with shopping at Aldi. I just realized I am spending a lot more to buy Costco’s (delicious) salsa than I would be if I bought it at Aldi. I need to start comparing ounce-to-ounce. Ounce to ounce Costco may be a little more expensive, but I wonder if their quality of product is better/fresher. Nicci– I have several friends who do not have a lot of storage– and they found they can store a lot under the bed and in the back of closets. Hope it helps. Thanks Jenny! We’re pretty short on closets too, but we are renting temporarily, so hopefully soon that problem will be solved. Under the beds is a good idea! I have been buying whole grains in bulk from the local health food store. Recently I started experimenting with buying spices in bulk. Even if I don’t buy a huge quantity, I’ve found that shopping the bulk aisle is financially savvy. I can’t believe how much I can save buying garlic powder, for example, on the bulk aisle. I have not found a better price for pepperoni than at Sam’s. We make pizza every week so this saves us a lot of money. You can store the bag in your freezer for months just taking out and using what you need. Thanks for the tip Lana, we make pizza most every week too, I’ll have to start getting my pepperoni at Sam’s! The only thing I buy in bulk is steel-cut oatmeal at Outpost. $4,95 for a 5-lb. bag. Great price! Because we don’t have a lot of space, I don’t buy too much in bulk, but I do buy what makes sense for us–things that I know we’ll eat before it goes bad. We buy staple bulk items mostly from Costco–yogurt, cottage cheese, butter, peanut butter, spices, granola bars, blocks of cheese, etc. I haven’t bought bulk of grains, rice, and those sort of items, but I will have to look into it. We have considered buying bulk meat from a butcher (a LARGE amount of various kinds of meat), but that will probably be a few years down the road, as our family isn’t quite big enough yet to make it worth while. Good things to think about, though! If you’re in the upstate SC area, I like to purchase my bulk foods from . For the longest time I couldn’t find anyone in my area, and shipping was too much to order stuff online. Hope that helps someone in my area! If you live near a Mennonite/ Amish area their general stores are a great resouce for spices, real butter, cheese, grains and herbal medicines. We go to our lake property at least once per summer, so I take my list and stock up on all our spices. I buy by the pound (not the ounce) but we use them also. They do have smaller sizes too, but spices keep a good while along with grains. The one I go to is just east of Urbana Missouri but I know they have one in Jamesport Missouri also. I do a lot of both buying in bulk (25 lb bag of rice) and buying in quantity when they’re cheap (10 oz can of refries, but lots of them). Quantity: canned food (but not huge cans, that goes to waste), pasture-raised chickens (usually whole, so I cut them into parts then make stock with the carcasses), toiletries, flour, sugar, … and lots more. Not in large amounts: desserts I cannot be trusted with, fresh produce, new foods. You do need to check unit pricing when buying in bulk or quantity. Too often the large container isn’t the best deal, especially when you have coupons to use. If you live in the South, then H-E-B has a good bulk selection of flours, nuts, grains, snack mixes, and spices. Another potentially good resource is a free app called Bulk for iPhone and Android, created by Bea Johnson of Zero Waste Home (). It’s a way to search for and rate stores that carry bulk supplies near you. The only drawback is that depending on where you live, you may have lots of options or few, as the results depend on what other people have listed in your area. However, the more people use it, the more information there will be! Canned cat food is definitely cheaper in bulk at Sam’s Club as compared with other local stores. We have a buying co-op through United Foods. Someone has to take on the responsibility of placing the order and receiving, but it is a great deal. Our group is up to a 12% discount. The great thing about UNFI is that you can split the bulk items among your group, so you get the price per pound of a 25# bag of oats, but you only have to take the 10# you want since someone else in your group took 15#. And each person can place their order online. Last year we split a half cow with my sister. For our family of four it lasted us almost a year. We still have about 4 lbs of ground beef left. It came out to only about $2 a pound and we got a lot of steaks and roasts out of it. Granted the majority of the meat was ground beef, it was still a great buy for us. We normally use at least a pound of ground beef a week (my boys are big meat eaters). I am sad to have to pay grocery store prices again for steaks! I don’t know if it’s just my area, but I have trouble finding bulk items that are cheaper than the everyday prices. Like oatmeal, the prices are kinda a wash and when I it goes on sale it’s defiantly cheaper and I just stock up then! Hey!! Montana Milling!! That is where I go to get my bulk wheat and oats!! I get to go direct there though! I totally agree with you about not buying in bulk unless you are SURE you love the product! I have made that mistake several times! I used to save a lot by doing the buy ahead principle, but right now our food storage area is limited and we also just have one fridge/freezer. I save a lot buy shopping at Aldi, and the few things I do buy in bulk are from Costco. I cringed when I read the $614 mistake – I felt so bad for you! Live and learn… thanks for sharing & hopefully none of your readers will make that mistake (thanks for sharing!). a turtle (or terrapin, if you’re in the United Kingdom). Sometimes buying in “bulk” doesn’t mean huge quantities. 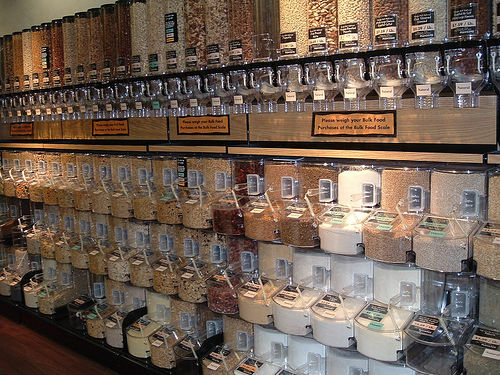 You can buy from the bulk bins in some grocery stores. I buy spices in small amounts from these bins. I just bought rosemary for .14! The same amount would have cost me several dollars.